Nitro and I love going to the Salem Rotary Dog Park everyday. Here are some photos from this last week taken at the Dog Park. Click here to check out our Salem Rotary Dog Park Camera which has a live feed to the park. Two against one...they like to get on each side of Nitro's face and take a hold of his cheek and pull! See what I mean they each have Nitro's cheek in their grip. Ouch! Nitro trying to escape the double team "smack down"! Nitro is like "Oh NO, two more dogs to tackle!" Nitro's Daddy makes him take a timeout so he doesn't get over heated. This is Diamond in the tube. Such a pretty Golden puppy! She is like "is the big hunky white dog looking at me?" Oh yeah girl you better work it! Nitro is like "Hi Mommy" thanks for bringing me to the park to play with all my friends. Even the kids were having fun on the big cement drain pipes. Check out this little Schnauzer puppy on the small dog side of the park. What a doll! 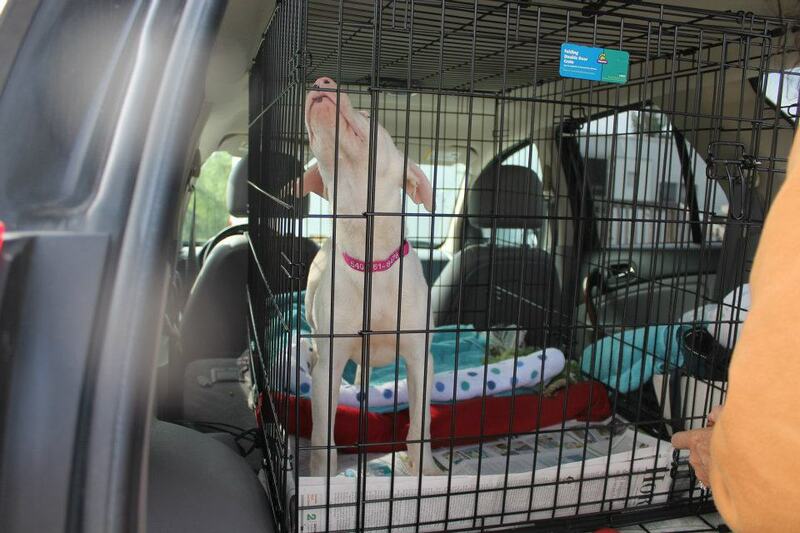 Deaf Dogs Rock Heads To South Carolina On A Rescue Transport. Last Tuesday my other dog blog, Deaf Dogs Rock Facebook page was swamped with posts from concerned DDR fans because someone had backed out of an adoption of a white deaf Doberman puppy at the Chesterfield, SC. shelter. So many people where worried that the puppy would be put down especially since it was not only deaf but also it was blind in one eye. Since no one stepped up to save the puppy I decided to go to South Carolina myself on Tuesday morning. I started out on my rescue journey by getting in my car at 5:00am on Tuesday and driving from Salem, Virginia to Chesterfield, SC. What a long and winding road, literally. It was 250 miles each way and I ended up being in the car for over 12 hours. I did pick up the deaf 11 week old puppy named Lorenzo and brought him back to the Franklin County Humane Society. 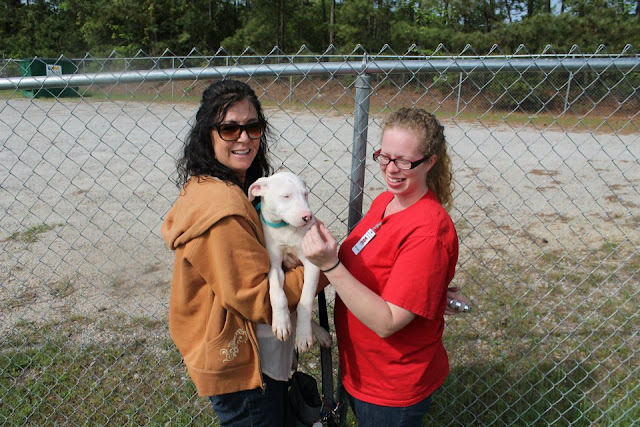 I was lucky the folks at FCHS were willing to send in rescue pull papers so we could get this pup to safety. 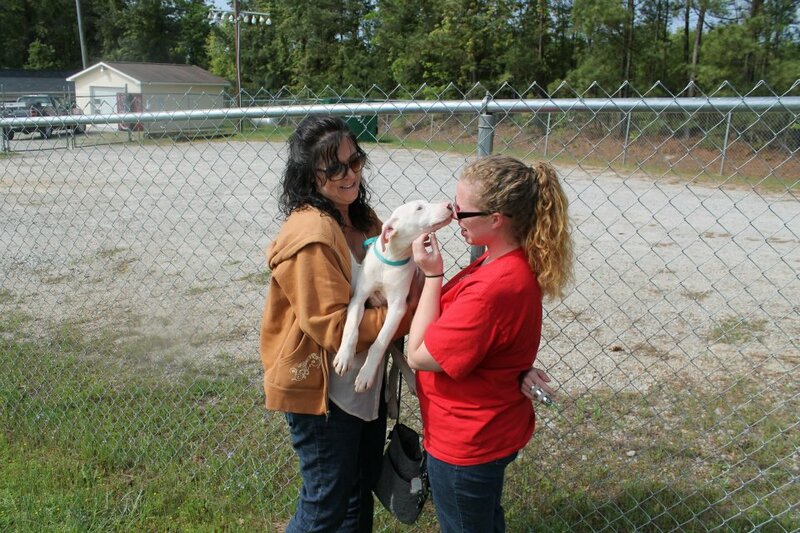 He will now go into foster care and so far we have received 3 or 4 applications from interested parties. I hope Lorenzo finds a great home with people willing to teach him ASL sign commands and build a strong foundation where he can mature and grow up to be a wonderful Ambassador for deaf dogs all over the world. A big shout out to Inglath Cooper and Anita Scott for helping me get this boy to safety. 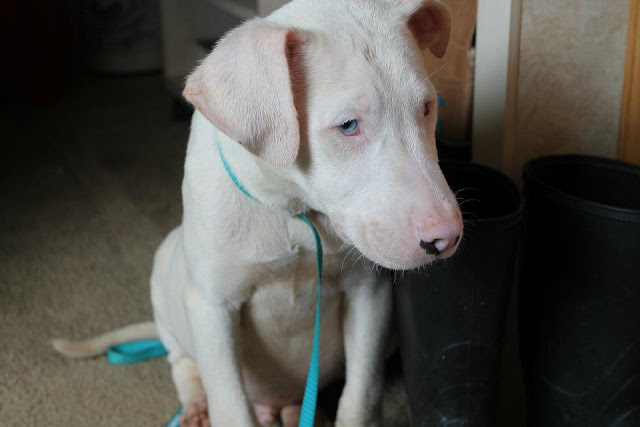 Our first photo of Lorenzo the white Doberman mix puppy. Pictured with me here is the new Shelter Director Danielle. She assured me the puppy wasn't in danger of being put to sleep but I did notice they have almost 60 dogs (in a temporary shelter way outside of town) so I'm still glad we got Lorenzo out of there. Danielle saying good by to Lorenzo. I had my crate set up and ready for Lorenzo so we could turn around and hit the road within 15 minutes of me arriving at the shelter. After I left the Chesterfield Shelter, I got about 15 miles down the road when I spotted what I thought was a dead baby deer until I saw it move. When I took a closer look, I saw a starving puppy eating trash on the side of the highway. A tractor trailer had just passed the dog and barely missed running over the pup. I didn't really have the time or energy to deal with another rescue, but I couldn't leave the dog on the side of the road. I immediately turned the car around and parked near the dog. I got out of my car and got low to the ground with some dog treats. The little dog started to run away until I got low to the ground and started making several really high pitched noises and then the little dog turned around and crawled over to me. I threw the dog some biscuits to draw him a little closer to me and then as soon as the little guy was within my reach, I snatched him up. I originally thought he was a puppy because he was so skinny but then I realized he was a young adult male dog. I had my husband call FCHS to tell them I was bringing in an emaciated dog I found on the side of the highway and for them to be ready for two rescue dogs to be admitted. The little dog was a scared starved two year old dog. I spent the whole drive giving it small morsels of food until it came off the front floor board of my car to sit next to me so I could give him lots of belly rubs. This little dog turned out to be a total sweet heart. He was getting neutered today so I went by the Humane Society to love on him and take a couple of pictures of his sweet face. The FCHS named the pup Chester. He will be going to a foster home at the end of the day and will be up for adoption soon. Here are some photos from this afternoon. I am hoping someone adopts this little dog and spoils him rotten so he will never ever have to eat trash from the side of a highway ever again. He is so lucky to be alive! He has the cutest Italian Grey Hound body but his face looks more like a puppy. My friends tell me in their second life they want to come back as one of my dogs because my dogs are so spoiled. For Christmas my husband Chris asked me what I wanted. I said I don't want anything. I told him at some point this year I would like him to build me a couple of nice dog kennel runs with a couple of dog houses inside of them. My thinking was this way I could run errands in the summer without subjecting Nitro to a crate inside the house. The photo below is what my sweet husband built the dogs at Bluebird Farm. He actually built the "Dogzeebo" as we call it with a covered front porch so he can hang his hammock to take naps with our dogs outside. He did an amazing job and the dogs totally love their new kennels. We keep the doors open so the dogs can go in there and hang out when we are home. Chris painted our new Dogzeebo to match our house and even put the same shingles on the Dogzeebo that our gables on our house have. Check Nitro just chilling out on his new front porch. Now he has somewhere to get out of the sun, wind and rain. They are beyond spoiled! Lexi, Nitro, Bailey, Tallulah, Chris and I would like to wish you a very Happy Easter and we hope you get time to spend with family and friends this weekend. Happy Hopping! You have the BEST park. I know I tell you that often, however, it's true. The golden you're playing with looks a little like my sister, JJ. I loved the pic of you in the tunnel. Mom says to share with your Mom that she is a K9 angel for all the good work she does. If it were not for people like her, K9s like me would have no chance. Thank you! We sure have a good time at the park. Nitro has about 20 different dogs he likes to play with. He is just a big goof ball! Thanks for stopping by! I just checked out your park. It's lit up a night! How nice! I loved seeing your pictures. The ones of the Schnauzer puppy were absolutely adorable. Of course, Nitro looks like the stud muffin he is. :) Just have to say he is the most in shape Boxer I have ever seen. That's probably a sad commentary on the Boxers I meet, but really it's a compliment to you and your husband. He's just beautiful. Thank you! He goes and runs at the dog park every day. Thanks so much for stopping by. He loves the park. Thanks for stopping by Frenchies! Just hopped by to catch up on your happenings and say hello! It looks like a LOT's been happenin'! Have a great weekend and Happy Easter! My Human is so glad you got those too pups to safe foster homes...she could tell you lots about dogs in the rural south but it's too long for a comment. This is the short version: Most of the rural south is poor and dogs are not allowed inside the house anymore than cows or chickens. Lots of shelters that at one time were no kill have had to change because of lack of adoptions, overcrowding and of course, no money. I noticed a couple of dead dogs on the side of the road and loose Pit Bulls and hound dogs everywhere so that is why I decided to bring little Chester here to Virginia because I know he will go to a loving home. I hope someone I know adopts him so I can visit him. He stole my heart. Oh Dog! You've been busy! Thanks for helping those dogs, especially that sweet little dobie mix. woo woo woo! 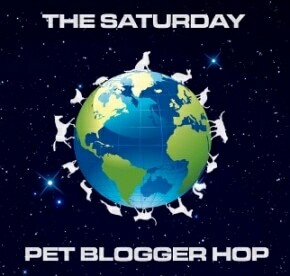 We have been very busy this week and our other blog www.deafdogsrock.com has kept us very busy so we are pretty thrilled things are going so well. Deaf Dogs Rock!